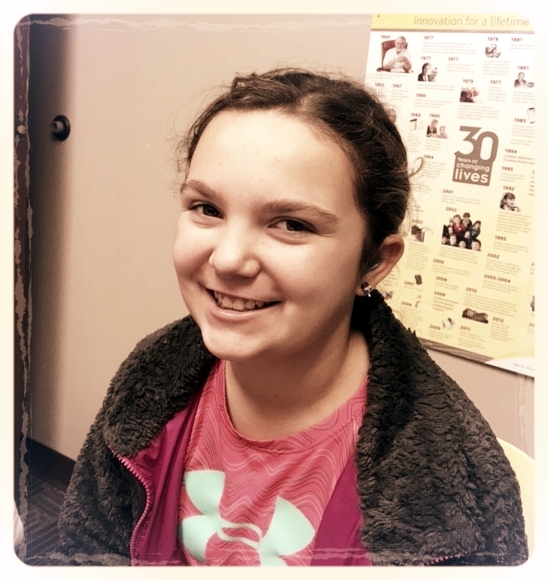 Adalyn was eleven years old when she was fit with hearing aids through HearCare Connection. This would be her third pair of hearing aids since she was diagnosed with hearing loss at six weeks of age. She chose to get some very cool Turquoises and Purple Ear Molds to stand out and was excited to see how these new hearing aids would help her hear better in school. She didn't take a back seat to her hearing healthcare. Adalyn volunteered along with her mom at United Way to complete her required volunteer hours. She worked on the Pizza King fundraiser, Santa Night and Stuff a Bus! She loved it and plans to keep volunteering with her mom. When you ask Adalyn what sound she is most looking forward to hearing, her answer may surprise you: she misses hearing her sisters squeal and scream around the house when they are playing. Adalyn thinks these hearing aids sound better than any she's ever had. "Everything is good. I like them." Adalyn, you're great! We like you! We hope you keep pushing for your dreams!